Natural glass has existed since the beginnings of time, formed when certain types of rocks melt as a result of high-temperature phenomena such as volcanic eruptions, lightning strikes or the impact of meteorites, and then cool and solidify rapidly. Stone-age man is believed to have used cutting tools made of obsidian (a natural glass of volcanic origin also known as hyalopsite, Iceland agate, or mountain mahogany) and tektites (naturally-formed glasses of extraterrestrial or other origin, also referred to as obsidianites). According to the ancient-Roman historian Pliny (AD 23-79), Phoenician merchants transporting stone actually discovered glass (or rather became aware of its existence accidentally) in the region of Syria around 5000 BC. Pliny tells how the merchants, after landing, rested cooking pots on blocks of nitrate placed by their fire. With the intense heat of the fire, the blocks eventually melted and mixed with the sand of the beach to form an opaque liquid. This brief history looks, however, at the origins and evolution of man-made glass. The oldest fragments of glass vases (evidence of the origins of the hollow glass industry), however, date back to the 16th century BC and were found in Mesopotamia. Hollow glass production was also evolving around this time in Egypt, and there is evidence of other ancient glassmaking activities emerging independently in Mycenae (Greece), China and North Tyrol. After 1500 BC, Egyptian craftsmen are known to have begun developing a method for producing glass pots by dipping a core mould of compacted sand into molten glass and then turning the mould so that molten glass adhered to it. While still soft, the glass-covered mould could then be rolled on a slab of stone in order to smooth or decorate it. The earliest examples of Egyptian glassware are three vases bearing the name of the Pharaoh Thoutmosis III (1504-1450 BC), who brought glassmakers to Egypt as prisoners following a successful military campaign in Asia. The first glassmaking “manual” dates back to around 650 BC. Instructions on how to make glass are contained in tablets from the library of the Assyrian king Ashurbanipal (669-626 BC). A major breakthrough in glassmaking was the discovery of glassblowing some time between 27 BC and AD 14, attributed to Syrian craftsmen from the Sidon-Babylon area. The long thin metal tube used in the blowing process has changed very little since then. In the last century BC, the ancient Romans then began blowing glass inside moulds, greatly increasing the variety of shapes possible for hollow glass items. 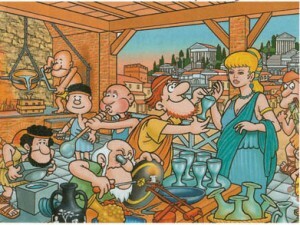 The Romans also did much to spread glassmaking technology. With its conquests, trade relations, road building, and effective political and economical administration, the Roman Empire created the conditions for the flourishing of glassworks across western Europe and the Mediterranean. During the reign of the emperor Augustus, glass objects began to appear throughout Italy, in France, Germany and Switzerland. Roman glass has even been found as far afield as China, shipped there along the silk routes. It was the Romans who began to use glass for architectural purposes, with the discovery of clear glass (through the introduction of manganese oxide) in Alexandria around AD 100. Cast glass windows, albeit with poor optical qualities, thus began to appear in the most important buildings in Rome and the most luxurious villas of Herculaneum and Pompeii. With the geographical division of the empires, glass craftsmen began to migrate less, and eastern and western glassware gradually acquired more distinct characteristics. Alexandria remained the most important glassmaking area in the East, producing luxury glass items mainly for export. The world famous Portland Vase is perhaps the finest known example of Alexandrian skills. In Rome’s Western empire, the city of Köln in the Rhineland developed as the hub of the glassmaking industry, adopting, however, mainly eastern techniques. Then, the decline of the Roman Empire and culture slowed progress in the field of glassmaking techniques, particularly through the 5th century. Germanic glassware became less ornate, with craftsmen abandoning or not developing the decorating skills they had acquired. Archaeological excavations on the island of Torcello near Venice, Italy, have unearthed objects from the late 7th and early 8th centuries which bear witness to the transition from ancient to early Middle Ages production of glass. Towards the year 1000, a significant change in European glassmaking techniques took place. Given the difficulties in importing raw materials, soda glass was gradually replaced by glass made using the potash obtained from the burning of trees. At this point, glass made north of the Alps began to differ from glass made in the Mediterranean area, with Italy, for example, sticking to soda ash as its dominant raw material. The 11th century also saw the development by German glass craftsmen of a technique – then further developed by Venetian craftsmen in the 3th century – for the production of glass sheets. By blowing a hollow glass sphere and swinging it vertically, gravity would pull the glass into a cylindrical “pod” measuring as much as 3 metres long, with a width of up to 45 cm. While still hot, the ends of the pod were cut off and the resulting cylinder cut lengthways and laid flat. Other types of sheet glass included crown glass (also known as “bullions”), relatively common across western Europe. With this technique, a glass ball was blown and then opened outwards on the opposite side to the pipe. Spinning the semi-molten ball then caused it to flatten and increase in size, but only up to a limited diameter. The panes thus created would then be joined with lead strips and pieced together to create windows. Glazing remained, however, a great luxury up to the late Middle Ages, with royal palaces and churches the most likely buildings to have glass windows. Stained glass windows reached their peak as the Middle Ages drew to a close, with an increasing number of public buildings, inns and the homes of the wealthy fitted with clear or coloured glass decorated with historical scenes and coats of arms. In the Middle Ages, the Italian city of Venice assumed its role as the glassmaking centre of the western world. The Venetian merchant fleet ruled the Mediterranean waves and helped supply Venice’s glass craftsmen with the technical know-how of their counterparts in Syria, and with the artistic influence of Islam. The importance of the glass industry in Venice can be seen not only in the number of craftsmen at work there (more than 8,000 at one point). A 1271 ordinance, a type of glass sector statute, laid down certain protectionist measures such as a ban on imports of foreign glass and a ban on foreign glassmakers who wished to work in Venice: non-Venetian craftsmen were themselves clearly sufficiently skilled to pose a threat. Until the end of the 13th century, most glassmaking in Venice took place in the city itself. However, the frequent fires caused by the furnaces led the city authorities, in 1291, to order the transfer of glassmaking to the island of Murano. The measure also made it easier for the city to keep an eye on what was one of its main assets, ensuring that no glassmaking skills or secrets were exported. In the 14th century, another important Italian glassmaking industry developed at Altare, near Genoa. Its importance lies largely in the fact that it was not subject to the strict statutes of Venice as regards the exporting of glass working skills. Thus, during the 16th century, craftsmen from Altare helped extend the new styles and techniques of Italian glass to other parts of Europe, particularly France. In the second half of the 15th century, the craftsmen of Murano started using quartz sand and potash made from sea plants to produce particularly pure crystal. By the end of the 16th century, 3,000 of the island’s 7,000 inhabitants were involved in some way in the glassmaking industry. The development of lead crystal has been attributed to the English glassmaker George Ravenscroft (1618-1681), who patented his new glass in 1674. He had been commissioned to find a substitute for the Venetian crystal produced in Murano and based on pure quartz sand and potash. By using higher proportions of lead oxide instead of potash, he succeeded in producing a brilliant glass with a high refractive index which was very well suited for deep cutting and engraving. 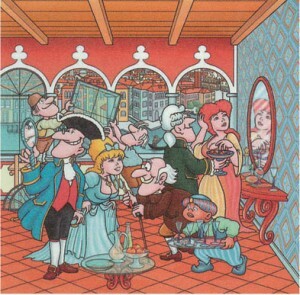 In 1688, in France, a new process was developed for the production of plate glass, principally for use in mirrors, whose optical qualities had, until then, left much to be desired. The molten glass was poured onto a special table and rolled out flat. After cooling, the plate glass was ground on large round tables by means of rotating cast iron discs and increasingly fine abrasive sands, and then polished using felt disks. The result of this “plate pouring” process was flat glass with good optical transmission qualities. When coated on one side with a reflective, low melting metal, high-quality mirrors could be produced. France also took steps to promote its own glass industry and attract glass experts from Venice; not an easy move for Venetians keen on exporting their abilities and know-how, given the history of discouragement of such behaviour (at one point, Venetian glass craftsmen faced death threats if they disclosed glassmaking secrets or took their skills abroad). The French court, for its part, placed heavy duties on glass imports and offered Venetian glassmakers a number of incentives: French nationality after eight years and total exemption from taxes, to name just two. It was not until the latter stages of the Industrial Revolution, however, that mechanical technology for mass production and in-depth scientific research into the relationship between the composition of glass and its physical qualities began to appear in the industry. .Another major contributor in the evolution towards mass production was Friedrich Siemens, who invented the tank furnace. This rapidly replaced the old pot furnace and allowed the continuous production of far greater quantities of molten glass. Towards the end of the 19th century, the American engineer Michael Owens (1859-1923) invented an automatic bottle blowing machine which only arrived in Europe after the turn of the century. Owens was backed financially by E.D.L. Libbey, owner of the Libbey Glass Co. of Toledo, Ohio. By the year 1920, in the United States, there were around 200 automatic Owens Libbey Suction Blow machines operating. In Europe, smaller, more versatile machines from companies like O’Neill, Miller and Lynch were also popular. Added impetus was given to automatic production processes in 1923 with the development of the gob feeder, which ensured the rapid supply of more consistently sized gobs in bottle production. Soon afterwards, in 1925, IS (individual section) machines were developed. Used in conjunction with the gob feeders, IS machines allowed the simultaneous production of a number of bottles from one piece of equipment. The gob feeder-IS machine combination remains the basis of most automatic glass container production today. In the production of flat glass (where, as explained earlier, molten glass had previously been poured onto large tables then rolled flat into “plates”, cooled, ground and polished before being turned over and given the same treatment on the other surface), the first real innovation came in 1905 when a Belgian named Fourcault managed to vertically draw a continuous sheet of glass of a consistent width from the tank. Commercial production of sheet glass using the Fourcault process eventually got under way in 1914. Around the end of the First World War, another Belgian engineer Emil Bicheroux developed a process whereby the molten glass was poured from a pot directly through two rollers. Like the Fourcault method, this resulted in glass with a more even thickness, and made grinding and polishing easier and more economical. An off-shoot of evolution in flat glass production was the strengthening of glass by means of lamination (inserting a celluloid material layer between two sheets of glass). The process was invented and developed by the French scientist Edouard Benedictus, who patented his new safety glass under the name “Triplex” in 1910. In America, Colburn developed another method for drawing sheet glass. The process was further improved with the support of the US firm Libbey-Owens and was first used for commercial production in 1917. The Pittsburgh process, developed by the American Pennvernon and the Pittsburgh Plate Glass Company (PPG), combined and enhanced the main features of the Fourcault and Libbey-Owens processes, and has been in use since 1928. The float process developed after the Second World War by Britain’s Pilkington Brothers Ltd., and introduced in 1959, combined the brilliant finish of sheet glass with the optical qualities of plate glass. Molten glass, when poured across the surface of a bath of molten tin, spreads and flattens before being drawn horizontally in a continuous ribbon into the annealing lehr. Pilkington ACI formed as a company combining the Australian interests of Pilkington Bros. and Flat glass interests of Australia Consolidated Industries. First Float Glass plant in the Southern Hemi-sphere opened at Dandenong. Although this brief history comes to a close nearly 33 years ago, technological evolution naturally continues. Not yet ready to be “relegated” to a history of glass are areas such as computerized control systems, coating techniques, solar control technology and “smart matter”, the integration of micro-electronic and mechanical know-how to create glass which is able to “react” to external forces. 15th centuries B.C. , and are primarily long-neck vases with spout. Glass artefacts found in Egypt date back to the time of the Pharaohs. 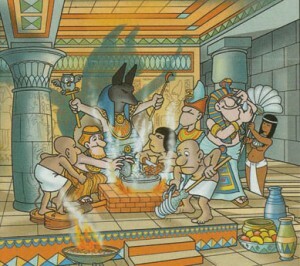 In that era, the Egyptians carried out a number of succesfull military attacks on Mesopotamia, Syria and Palestine, and they probably learned the make-up and methods for melting glass from expert glassmakers among their prisoners. In the same era, Egyptian glass factories produced a great variety of objects such as pearls,scarabs, amulets, furniture knobs and inlays, as witnessed by the finds in the tomb of Tutankhamon. Bronze Age industry flourished in the eastern Mediterranean area in the period of greatest splendour of the major civilizations, between the early 15th and the 18th century B.C. Yet while knowledge of glass making techniques spread rapidly, glass itself remained a rare, expensive material, considered similar to precious and semi-precious material like hard stones or gems, due to the difficulty in production. Glass factories were probably based in the largest urban centers and operated under the auspices of the king or the aristocracy. These were, in reality, small-sized workshops capable of only limited production (no, there were no Monmin at the time!) Glassmakers were an elite class of workers devoted to an“esoteric” art: their methods were considered fruit of their ability, but were also linked to magic and occult powers. Would you have ever guessed, Master Glassmaker? Was there a slump then too? Even in ancient times your “wizard” ancestors weren’t spared by economic slumps. Around 1200 B. C. , many of the major cities of the late Bronze Age had been destroyed by war and famine. The Minoan and Mycenaean culture (from southern Greece, Crete and Cyprus) and the powerfull Hittite kingdom in Anatolia dissapeared completely. After the fall of these states, the eastern Mediterranean area and the western Asia went through a period of barbarism and cultural decline that brought on a serious commercial and industrial slump, especially in the production of luxury items, including glass.